Another one from the archives today. Except I've modified it a little to make it just a tiny bit more healthy and easier for prep. If you've been following my posts for a while you will know that both mushrooms and cheese are on my favorites list. I often cook with them and when I go out to eat I usually choose something with mushrooms in it- I like portabella, shitake, regular white- all of them! These can be made with all sorts of fillings though so if you don't like mushrooms there's nothing to worry about. You can add broccoli, spinach, any sorts of cheeses etc. You can also use whole wheat wraps if you prefer an even healthier option Whatever you do it is sure to be tasty! 1. Start by chopping off the stems of all of the mushrooms and then clean them thoroughly. Then chop them into small-medium sized pieces. Then chop up red onion. Put the vegetable oil in a medium sized non-stick sauté pan. Heat up the oil and drop in the mushrooms, onions, garlic, onion powder, salt and pepper. 2. Saute' the vegetables until slightly browned and cooked through. 4. 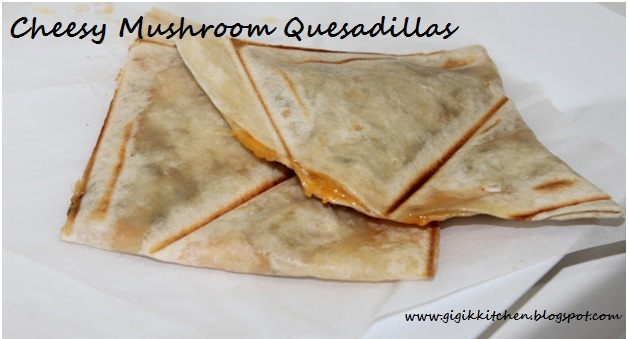 Fold the empty half of the tortilla over the half with the mushrooms and cheese. Press down firmly to fold. 5. Take the prepared tortilla carefully and place it in a grilled cheese sandwich maker lined with parchment paper or a frying pan with some oil. Allow it to brown on both sides before removing them to a plate. 6. Allow them to cool a little and cut in half for that wedge appearance. Serve warm.